Let yourself be seduced by the Maison Bleue, a cozy little nest for holidays with family or friends. Located at the foot of Mont Sainte Odile 5 km from Obernai with free and unlimited WIFI, comfortably equipped and pleasantly furnished. Here you will find the authenticity of the Alsatian charm. A real pleasure for our guests who feel "at home". To relax, you have your own walled garden with terrace, garden furniture, deckchairs, barbecue and wooden cottage with slide for children. Depending on the seasons, Saint-Nabor enchant you with its tranquility and living environment. The Blue House is located on our property, we will be enough for you. We often share with our guests our home-made flamekueches cooked in our flambé pie oven. A good way to get to know each other and give you good advice for a pleasant stay. You will be in the paradise of the hikers with magnificent walks in the vineyard or in the surrounding forests with breathtaking views of the Plaine d'Alsace. A good holiday in perspective! - Linen provided (dish towels, rags). - Wooden Maisonette with slide for children. Feel free to look at the listing of our other rental in the city center of Obernai for 2 people. The bathroom is new and modern with a bathtub and shower. Separate toilet. My family really enjoyed our long weekend in the beautiful Alsace region of France. La Maison Bleue is located in the quiet, picturesque village of Saint Nabor. The cottage was cozy, clean, and nicely decorated. We were greeted with a warm welcome from the owner. She also gave us recommendations of places to go. One of them being a gluten free bakery in Obernai! My son is trying to convince us to return again just to eat more french pastries. The kitchen was well stocked, and perfect for a vacation. The owners made sure firewood was always available for the fireplace. Saint Nabor itself does not have any restaurants or shops, but within a few minutes you can drive to several in the nearby towns. We enjoyed hiking around the Mont Saint Odile Monastery, we also hiked several trails to explore the Chateau Spesburg and Chateau d'Andlau. 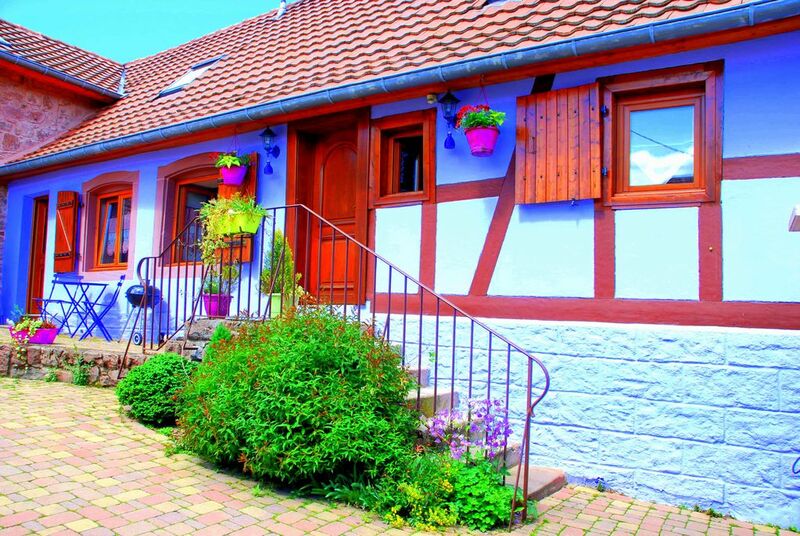 La Maison Bleue is perfect if you want to take day trips to Strasbourg, Obernai, or Colmar. We zijn vanuit het Schwarzwald twee nachten in Saint Nabor geweest. Deze tijd hebben we gebruikt enkele charmante dorpjes te bezoeken zoals Ribeauvillé, Colmar en Obernai, maar het hoofddoel was Straatsburg. De interessante mengeling van Duits en Frans wordt treffend weergegeven door het beeld op de Place de la Republique in Straatsburg. Het huisje is heel compleet ingericht. De bedden waren wat zacht, maar dat is natuurlijk een persoonlijke voorkeur. La Maison Bleue is immaculately presented and well-equipped. It is compact, but was perfect for three adults and a Labrador. It is very comfortable and easy to care for, with hard flooring throughout. We particularly appreciated the excellent kitchen, with a fan oven and induction hob, as we catered for ourselves throughout the week. We had glorious weather (more like high summer than early Spring) so were able to make good use of the terrace and garden. Madame Riche and her family were away when we visited, but she had made arrangements for us to collect the key when we arrived and for the housekeeper to see us off when we left. The gîte lies at the foot of Mount Saint Odile and is less than 200m from the Urlosenholz Wood, with way-marked footpaths good for walking, running and mountain-biking. There are numerous walks in the local area, with several suggested circuits around the next door village of Heiligenstein and, just a short drive away, at Le Hohwald. The village is conveniently placed for excursions to Obernai, Colmar and Strasbourg and is surrounded by vineyards offering wine tastings. Saint-Nabor itself has no shop or restaurant but there are restaurants and a well-stocked Proxi convenience store and boulangerie in Ottrott (less than 1km away) and a Leclerc supermarket in Obernai (on the Boulevard de l’Europe). Guests travelling from Britain with pets might find it useful to know that we found an English-speaking vet in Obernai (Clinique Vétérinaire Brabants at 5 rue Murner). Wonderful! In spite of unfortunate weather, we enjoyed our week stay at this lovely gîte. The cottage is perfectly clean and very cute. The surrounding garden is absolutely immaculate; certainly looked after with great care. The owners are a lovely, warm family. My young kids played well with the two little girls, sharing toys and interacting with no problem. When we realized that the weather report we had read prior to leaving was highly inaccurate (! ), Emmanuelle was nice enough to offer to wash our laundry so that we could rewear our warmer clothing due to the unusually soggy weather. We made numerous half-day trips, and the entire area we saw was peaceful, adorable, and so tidy! Emmanuelle speaks good English and can make suggestions for activities. Our itinerary included Obernai, Montagne des Singes (Barbary monkey reserve with wonderful cafe and playground facilities), le Palais du Pain d'épices (gingerbread museum and workshop), Cité du Train (excellent train museum) and wandering in the nearby vineyards. Cannot say much about restaurants, since we don't often eat out with three young kids, but there are weekly markets throughout the area (ask Emmanuelle) offering quality produce and prepared foods (perfect for small meals back at the cottage or picnics). Ditto on the wine, but locally produced wine is available at the MANY wineries in these beautiful villages. Overall, I'd recommend this place for a group of four or fewer people. Great location and very nice people. Thank you, Emmanuelle! Hello Andrea and all the family! Thank you so much for your kindness. It was such a pleasure to see the kids playing all together in the garden! Bons baisers de France à nos amis américains. Emmanuelle et toute la famille! Séjour très très agréable avec une petite surprise lors de notre arrivée. La propriétaire a pris soin de nous en nous allumant un petit feu de cheminée!! Au top et Merci. Un séjour que je recommande avec un endroit très chaleureux et calme afin de bien se ressourcer. Hat unsere Erwartungen bei weitem übertroffen. Alles wie beschrieben vorhanden und in einem sehr guten Zustand. großer Wohn- Kochbereich mit allem was man braucht. Acompte: 30% du prix du séjour Caution: 300 euros Accueil petit animal: 20 euros par séjour. Si vous ne souhaitez pas faire le ménage, nous vous proposons de le faire pour un tarif de 50 euros. Possibilité de louer le linge de lit pour 10 euros par lit.